In today’s highly complex business landscape, enterprise architects (EAs) are poised to show business leaders how they can leverage technology to achieve business objectives. Clearly, the pressure cooker of digital transformation is a great opportunity for these “smartest guys in the corner” to shine. EA’s have a lot of expertise and value but are challenged to communicate it in terms that resonate with the business. Enterprise Architects adopt many popular EA frameworks to help them capture architectures, but these frameworks don’t necessarily communicate business value. For business leaders, they want to know what products and services are being delivered, how to fit projects into a bigger ecosystem, and most importantly how to achieve desired business outcomes and strategic goals. 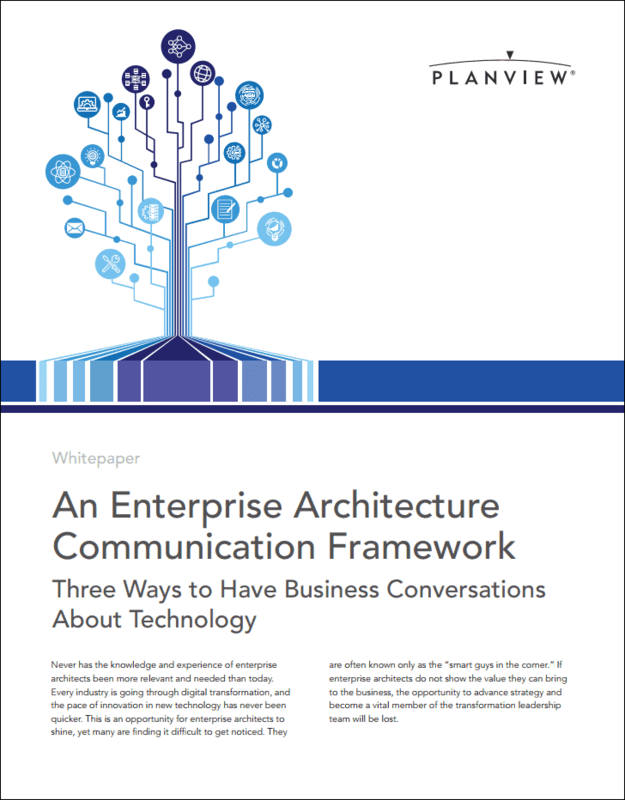 In Planview’s new white paper, An Enterprise Architecture Communication Framework: Three Ways to Have Business Conversations About Technology, we outline how to effectively grab the spotlight in a business-oriented way. As every industry struggles to respond to changes in the market and adapt to customer demands, EAs should seize the moment to drive innovation, show value, and advance strategy. Check out the infographic in part 1 of this series. Get to know your stakeholders – Stop guessing and start listening to business leaders. This allows you to identify routine questions and focus your limited time and resources on better understanding your audience. Prioritize and define specific outputs – By prioritizing a manageable amount of work that can be delivered in 30 to 60 days, you can deliver value early and often, and more easily answer key questions and increase outputs. Collect and manage data to answer questions – Ensuring data accuracy and managing data effectively is critical to your success. Bridge the gap by managing large amounts of information and translating it into something meaningful for the business. Make sure you can scale to provide views across the scope and size of your portfolio. Traditional architecture frameworks are not sufficient to drive digital transformation for modern businesses. Enhance your EA practice by adding a simple enterprise architecture-to-business communication framework to help you communicate better with key stakeholders and decision-makers. Previous Planview Blog post, What Are the Benefits of an Enterprise Architecture Framework?